Betting boxing these days? Well, Bryant “By-By” Jennings (19-0, 10 KO’s) is a 20:1 underdog in most betting circles against his opponent, “Dr. Steelhammer” Wladimir Klitschko (63-3, 54 KO’s). The American heavyweight will face a monstrous task in the 6’7” Klitschko at Madison Square Garden tonight. The boxing event is a rare heavyweight card at the Garden since Klitschko hasn’t fought at that arena in seven years, when he defeated Sultan Ibragimov. NOTE: Ibragimov has not fought since that severe beat down. HBO boxing shouldn’t expect record breaking numbers since Jennings isn’t a thrilling fighter to watch. And Klitschko is a safe heavyweight who only goes for the knockout if he sees an opening. Hayden Pannetierre is the fiancée of Wlad and the couple have a daughter together. She will most likely be in attendance, as will Wlad’s older brother, retired heavyweight phenom, Vitali Klitschko. We don’t consider this a title boxing fight since the chances of Jennings winning tonight are slim to none. It’s a pretty sure bet that Wlad will easily outpoint and maybe even stop Bryant in a not so thrilling main event. 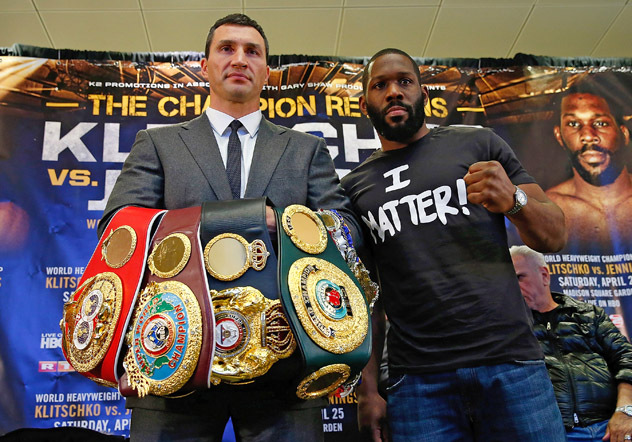 Anything can happen in combat sports and boxing belts change quite often but when it comes to heavyweight boxing, there is none more commanding of his division than the one and only Wladimir Klitschko. Our official prediction: Wlad Klitschko will probably win by way of ref stoppage in the late rounds. Sorry, Bryant. There’s no shame in losing to a Klitschko.